Dental implants are changing the way people live. They are designed to provide a foundation for replacing teeth that look, feel, and function like natural teeth. A person who has lost teeth regains the ability to eat virtually anything, knowing that teeth appear natural and that facial contours will be preserved. Patients with dental implants can smile with confidence. Best dental implants clinic in delhi and india with affordable cost. Once you learn about dental implants, it can provide a doorway to renewed self-confidence and peace of mind. We understand how tooth loss can affect self- confidence, ability to eat and may discourage you from smiling. Dental implants are small titanium posts that are surgically placed into the area where teeth are missing. They act as tooth root substitutes. The bone bonds with the titanium, creating a strong foundation for artificial teeth. Dental implants are stable anchors for artificial replacement teeth. Once the dental implants are beneath the surface of the gums they begin bonding with the jawbone. 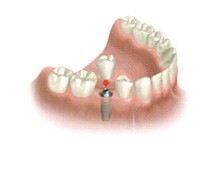 After the implant has bonded to the jaw, an abutment and final crown is placed on the implant . Don’t worry, at no time will you be without a tooth. A temporary tooth or flipper can be made that appears and functions normally. Most patients experience minimal to no disruption in their daily life and are smiling with confidence as they leave the office. 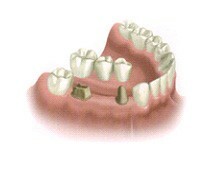 Why choose dental implants over traditional dentures or bridgework? While traditional dentures and bridgework can help to improve the appearance of missing teeth, many people find them inconvenient, uncomfortable and less natural looking. For many people, dental implants offer clear advantages over traditional dentures or bridgework. In addition to being a more aesthetic choice, dental implants also feel and function more like your natural teeth. What’s more, with dental implants, there’s no need to sacrifice healthy adjacent teeth to provide support for bridgework. What type of dental implant surgery is best for me? The specific type of dental implant surgery that will be best for you will depend on many factors, including the number and location of missing teeth, whether any tooth extraction is required, the condition of your jawbone, and your overall health. Dr. Singh will carefully assess your individual situation and recommend a personalized treatment plan that’s right for you. Dr. Singh will be able to help with any tooth extraction or bone grafting required, as well as placement of the implants. Your regular restorative dentist or the team at SCODE will work with you to make and then fit your replacement teeth. The number of dental implants needed will depend on the location and number of missing teeth, as well as the type of prosthesis (replacement teeth) chosen. If you are considering implants, your mouth must be examined thoroughly and your medical and dental history reviewed. If your mouth is presently not ideal for implants, Dr. Anurag Singh can create a custom treatment solution for your situation. We have many comfortable ways of achieving your desired outcome. We often see patients for 2nd opinions. Many of these patients were told that they were not implant candidates. Dr. Anurag Singh’s expertise and our high technology tools have allowed us to help many of these wonderful patients Call our office, at + 91-11-46045152 / + 91-11-46045153 , for an appointment today. Patients desiring General Anesthetic are treated in hospital set ups. Once the implants are in place and with proper care, they will serve you well for many years. This means taking the time for good oral hygiene (brushing and flossing) and keeping regular appointments with your dentist. Despite decades of clinical and scientific research, dental implants do not have a 100% success rate. However, the success rates have improved dramatically since the introduction of dental implant surgery and the dental profession can proudly report success rates well above 90% for most implant patients. Similarly, long-term success rates are in the high 90% range and are likewise improving. When a dental implant has not successfully integrated, it may need to be removed, as it cannot easily be “converted” to osseointegrate. At SCODE INDIA Dr Anurag Singh (Maxillofacial Surgeon & Implantologist) will give you best advice about this. A replacement implant can be placed but it may require some months of healing time and possibly bone augmentation (repair by means of grafting). Likewise, if a previously placed implant has lost significant amounts of supporting bone, there are currently no treatments that can predictably restore the lost bone after it has been in function in the mouth. At SCODE INDIA Dental Clinic, we are specialized in dental implant surgery. You can get quick Dental Appointment for dental implant surgery by calling on 91-11-46045152/ 53 / +91-9599645706 or Click here for Online Dentist Appointment. Dental implant surgery Dentistry & Dentists at SCODE INDIA are among Dental Implants in Delhi at affordable dental implant cost. We are the best dental implants clinic in delhi. Foreign Patients can email us at connect@dental-delhi.com for dental implant surgery appointment in India.